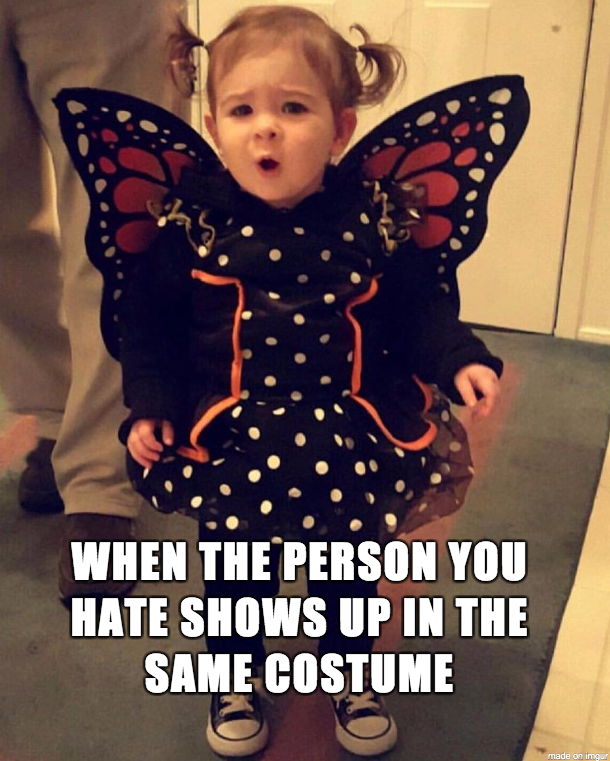 For the viral content challenge, I chose to utilize a comical picture of my niece in her Halloween costume and to caption it with “When the person you hate shows up in the same costume.” During the early planning stages, my overall strategy was to actively engage millennials through Twitter with a comical holiday meme. I wanted my niece to become the next toddler face that everyone could caption. I had a few goals and objectives in mind. As the campaign got started, I had over 200 views within a couple of hours on Imgur. I began to set up my tweets utilizing Tweetdeck and immediately I was receiving some favorites and retweets and a quote. Overall on Twitter, I tweeted out about my meme four separate times to test what time of day would perform better. The time that did the best in terms of engagement and favorites was in the middle of the day at 3 p.m. on November 7th, my Twitter Webcard. I then began to set up my Sassy Butterfly Ad Awareness Campaign through Twitter Ads to run from November 8th to November 12th spending no more than $5 total. I put a lot of thought into the target audience (18-34 year-olds) and user interests. The interest list consisted of Halloween, family, party, daycare, baby apparel, and babies and toddlers and they had behaviors of candy buying and costume buying. Over the course of those five days, I received 1, 749 impressions for just $5 with two of my tweets about the meme. My Twitter Webcard received 81 link clicks thanks to Twitter Ads. In class, my meme was one of the most popular in terms of “dot votes” before the campaign actually started. When the campaign was up and running though, a few days in, the views plateaued. I began to realize that I might have to alter some of my tweets to get users to actually click on the link, or I might have to adjust my thought process in terms of my objectives. Like any campaign, you go into it with high hopes, but might come to the conclusion that things may not go as planned and you have to figure out new content creation ideas! So what could I have improved on? On Imgur, I received 364 views in total. After taking the time to sit back and review, I think I could have done a few things differently to get even more views. Although the Halloween concept was timely, this campaign took off slightly after the holiday. I could have adjusted the caption to be something along the lines of, “When you hear someone playing Christmas music on November 1st.” I could have then added some #christmas hashtags because there is always conversation on social media about how rapidly some people start getting into the Christmas spirit after Halloween. This would have been a bit more relevant in my opinion, and I could have altered my audience to be a little more broad instead of so categorized to receive more impressions and link clicks. Furthermore, out of 1,749 impressions, I still had 364 views. To me, this says that I could have instead tried to be more engaging with my Twitter posts themselves to actually get users to click on the links themselves. I adjusted my last scheduled post on November 13th to be a gif of a baby dancing along with the link, and it actually received the highest amount link clicks on a non promoted tweet. The biggest challenge for me was working with an actual link instead of just a picture on Twitter. I could have all the impressions in the world, but still not receive any clicks on the actual link. The biggest lesson from this was to try to be more engaging in terms of thinking about what would make people actually click the link. Perhaps, since my audience engagement on Twitter Ads was Halloween candy buyers for example, I could have also posted my meme to Facebook where there are a lot of adults with kids who would potentially find this funny. Although I had the right intentions with millennials as my target because they are Twitter users, I cannot forget about exporting all of my options first.